Nintendo investors had a tough 2018, but it appears their luck may be changing. An actionable monthly buy signal has appeared on the stock chart. 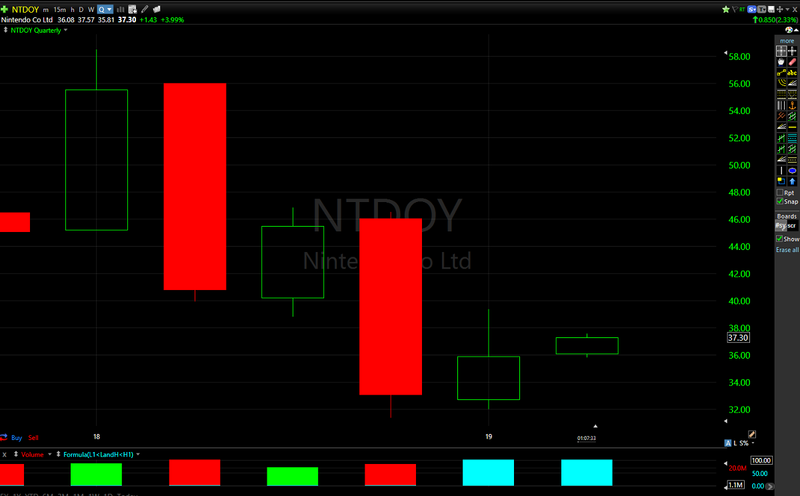 NTDOY jumped above $36.35/share this week. There is now an actual reason to get long this stock with a defined stop loss. This buy signal will be active as long at NTDOY stays above $36.35/share throughout the month of April. There is also a potential setup for a long-term quarterly buy signal if the stock gets above $39.34/share during the next three months. Nintendo's stock is set up for a potential buy signal on the quarterly chart if it gets above $39.34/share. 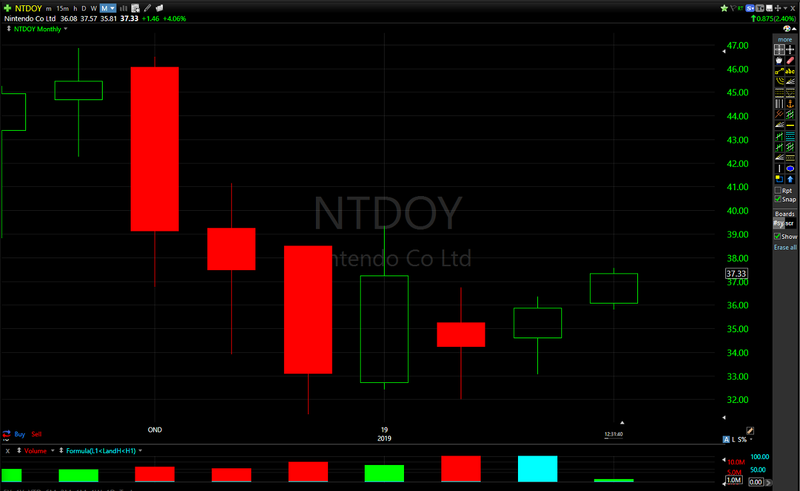 We alerted Shackers to this potential buy signal in our Game Trader technical analysis video that went up earlier this week, and it appears that Nintendo (NTDOY) stock traders finally have a reason to put some capital to work. The company will report its earnings results on April 25, after lowering full-year expectations for Switch sales in the previous quarterly earnings release. Things are definitely setting up for the stock to move materially higher if the Big N can beat their reset expecatations. We wanted to make sure to alert our readers and viewers as the potential bullish technical setup was merely hypothetical at the time this video was published. There is now an actionable buy signal on the monthly chart, and a potential setup for a quarterly buy signal. Nintendo's stock performed very poorly in 2018, but it looks like things might be turning around for patient shareholders who didn't dump the stock at the first sign of weakness. I will be publishing a Game Trader financial analysis piece in the next few week, but don't expect any changes to Nintendo's Super Mega Buy rating. It remains my highest conviction investment idea. Today's news is about the technical indicators on the stock chart, but financial news and charts tend to work together and this bullish signal could lead to great financial news later this month. Keep it locked on Shacknews for more financial and technical analysis of tech and video game stocks. Indeed. This thing might stop going down.